Orthodontics is the dental specialisation that includes diagnosis, prevention and treatment of dental misalignments, as well as the correct development of jaw bones and facial harmony. Orthodontists specialise in correcting not only poorly aligned teeth, but also improving the function of the stomatognathic system. Often, besides correcting tooth positioning, jaw positioning needs also correcting in order for the dental rows to find the correct alignment. The orthodontist’s work is not only aesthetic: proper teeth alignment fosters correct chewing and improves hygiene, which in turn contributes to avoiding tooth decay and periodontal disease or gum disease. How old should my children be before I take them to the orthodontist? About 6 or 7 is the ideal age for parents to take their children to the orthodontist, since that is the time when baby teeth start to get replaced. The health of definitive teeth will depend on how well we have cared for the milk dentition. Therefore, if a baby tooth has cavities, they will have to be filled, as it is very important that the deciduous dentition is maintained until the definitive teeth appear. What is the ideal time to start an orthodontic treatment? There is no ideal age to start a treatment and every case should be studied individually. Sometimes a treatment may begin at age 6 or 7; in other cases 11 or 12 is the most appropriate time. Depending on the case it may be preferable to act early, for instance in the presence of deforming habits that may worsen the situation overtime. On the other hand, it may be preferable to wait for the definitive dentition to appear. In adult patients, however, orthodontic treatment may begin anytime; there is no age limit to correct dental misalignments. Nowadays, crooked teeth can be aligned at any age. If you are unhappy with the positioning of your teeth, you should know that excellent aesthetic and functional results may be obtained with orthodontic braces. What types of braces are used? 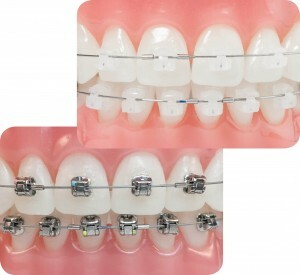 There are two main kinds: on the one hand we have removable braces, which are placed and removed by the patient. They are mostly used by children. These braces, beside correcting tooth positioning, also stimulate and guide maxillary growth, favouring a correct jawbone remodelling. On the other hand there are fixed braces, whereby brackets are installed on the teeth that allow for the movements to be made. The patient may not remove these, but they do not interfere at all in their daily activities, neither to eat nor to talk nor play a musical instrument. Brackets may be metallic or white, and these are less visible and give a more pleasant aesthetic effect. How long should orthodontics be worn? With the current techniques of orthodontics, treatment times have been shortened considerably. A proper orthodontic study should give us an indication of the exact duration of the treatment, but in general terms an orthodontic therapy may take between six months and two years, depending on the severity of the case. At Clínica Dental Abril, in addition to these conventional treatments, we have another orthodontic method that has revolutionised the field in recent years: it is known as the Damon technique. The advantage of this technique is that it can be carried out without any dental extractions; the forces applied are softer and lighter, which translates in a much higher comfort for the patient.